Our team of instructors are highly qualified to provide the requested training for your needs. AHT has worked extensively to support agencies in their efforts to be compliant with the National Incident Management System (NIMS). In particular, AHT has trained and certified thousands of first responders, governmental and civilian administration and support personnel in NIMS, the National Response Plan and Framework, and all levels of this Incident Command System (ICS). Also, in accordance with U.S. Department of Homeland Security guidelines, all of our exercises include a review of participants’ use of NIMS and ICS. 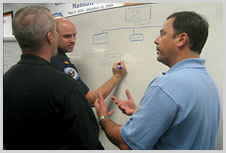 All AHT instructors meet or exceed the requirements as defined by the Department of Homeland Security National Incident Management System Training Program, 2011, National Integration Center (NIC) Incident Management Systems Division and the National Emergency Training Center: Emergency Management Institute and National Fire Academy. Instructors have successfully completed ICS-100 through ICS-400, IS-700 (National Incident Management System) and IS-800B (The National Response Framework). Instructors have extensive experience in lesson content and presenting all courses. Lead instructors have served as an Incident Commander, or on Command or General staff in an incident that went beyond one operational period and have developed and written numerous incident action plans. Worked in an incident that included multi-agency coordination. Unit instructor served as Incident Commander, or on Command or General staff in 50 or more incidents. All of our courses and training meet or exceed nationally recognized industry standards and standards established by Incident Management System Division/National Incident Management System (NIMS) Integration Center for courses as taught by the Department of Homeland Security (DHS). All Applicable courses meet the content and objectives outlined in the National Standard Curriculum Training Development Guidance, required by the NIMS Integration Center. Note: For All-Hazards ICS Position Specific Courses, all of our lead instructors are pre-qualified by their State Training Officers (STO's) and are on the list of lead instructors authorized by the FEMA National Emergency Training Center, Emergency Management Institute for Position Specific courses. In addition, all of the lead instructors have had experience and are fully qualified Type 1 or 2 Incident Management Teams for their position/s and have functioned in that capacity at an incident that required multiagency coordination that went beyond one operational period and required written Incident Action Plans. This is a requirement in order to qualify and be credentialed for inclusion in the FEMA National Emergency Training Center, Emergency Management Institute ICS Position Specific list. In addition, our Performance-based Exercise Programs are led by our Master Exercise Practitioners, certified and credentialed by DHS/FEMA through the Master Exercise Practitioner Program (MEPP). This form the basis of the All Hazard Training Exercise and Evaluation teams. Our MEPP-certified team members have completed prescribed training and demonstrated, through hands-on application, a high degree of professionalism, capability and familiarity with all aspects of emergency management exercises. Moreover, our All Hazard Instructors and Master Exercise Practitioners have extensive experience in all aspects of preparedness, response, recovery and mitigation including hands-on response and recovery experience with tropical cyclones, severe weather events (tornado, high wind, freezes, etc. ), wildfires, inland and costal floods, mass migration, hazardous materials and radiological emergencies, oil spills, pandemics, civil unrests, and major transportation incidents.